Boy cranberry recipes have come a long way over the years. When I was a kid the only cranberry that we were exposed to was the one that Mom dumped out of the can. It still had the ridges of the can indented on it when it was placed on a plate, sliced and served for Thanksgiving!! I don’t think any of my brothers and sisters took a slice for any of the Thanksgiving dinners that we had together. Now cranberries really are delicious when prepared properly and this recipe is no exception to that rule. 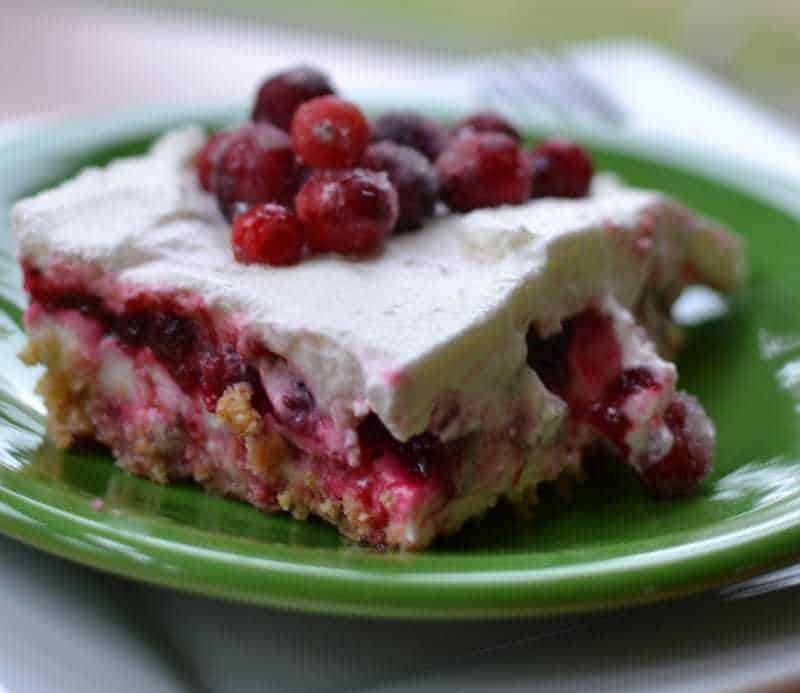 Cranberry Lush Cake brings out all the best that cranberries have to offer. 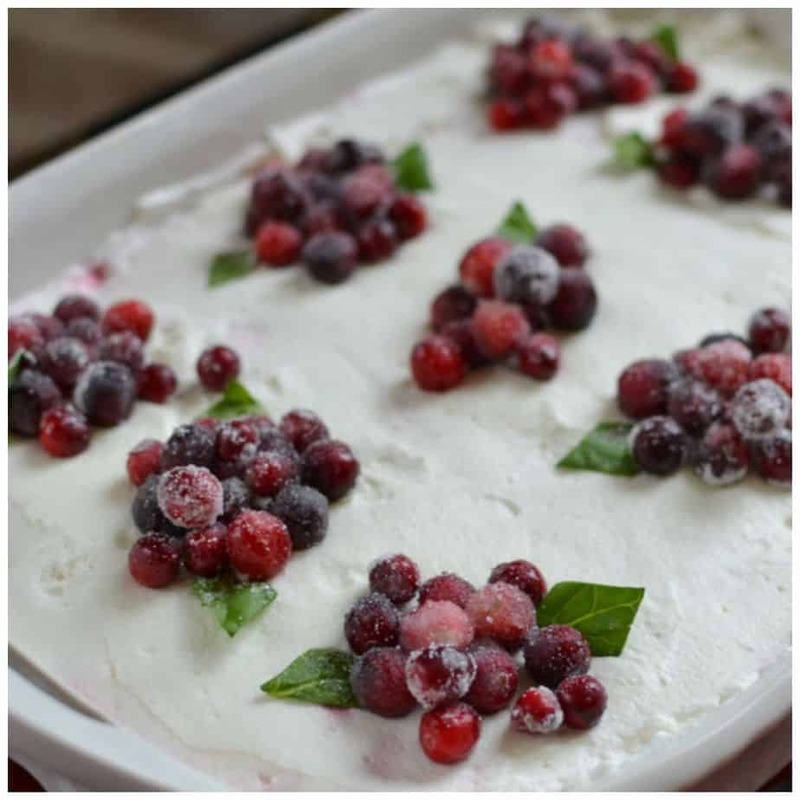 Love these little beauties and when accompanied by a graham cracker crust, sweetened cream cheese, whipped cream and candied cranberries I feel like I just got a taste of heaven. This beautiful cake is perfect for the holidays. It is just beautiful and festive. Did you know that cranberries have been shown to have an anti-inflammatory effect? The antioxidant components of cranberries are also linked to a reduction in blood pressure and improving cardiovascular health. I love this beautiful Cranberry Lush Cake and hope that you do to. I think I am going to make this beauty for a couple of events that we are having and going to over the month of December!! 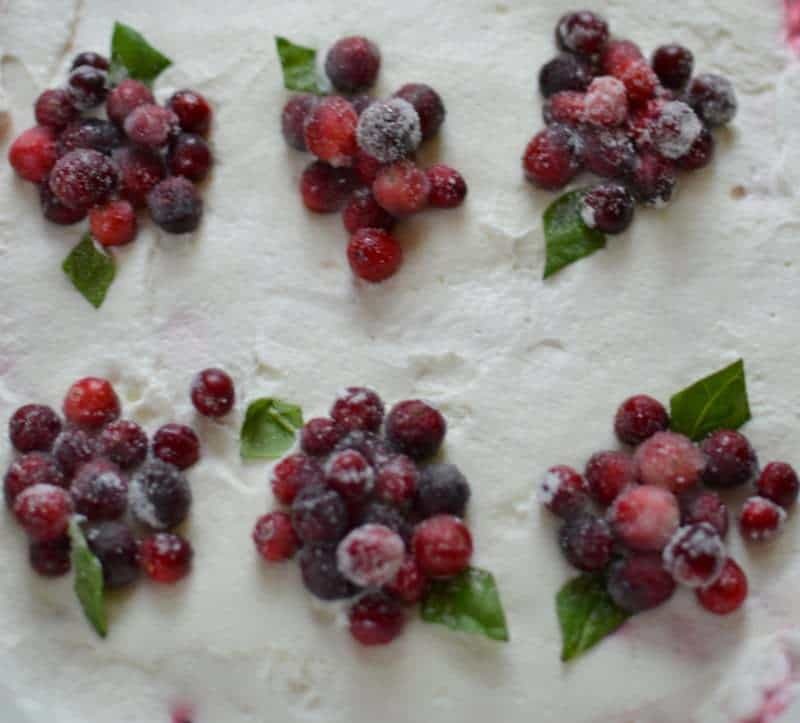 If you are a cranberry lover like myself you need to try my Cranberry Orange Bread, Easy Cranberry Orange Daiquiris or my Mini White Chocolate Cranberry Cheesecakes. In skillet heat 1/2 cup water and 1/2 cup sugar over medium heat until sugar dissolves; stirring occasionally. Cool water for 20 minutes. Soak 1 1/2 cups cranberries in water for 15-30 minutes. Remove cranberries from water (reserve sugar water for step two) and place on drying rack. Allow to dry until tacky to the touch; approximately 45 minutes. Place 1 cup of sugar in large Ziploc bag. Gently roll tacky cranberries in the bag. Remove from bag and place back on drying rack for at least 1 hour. Pour sugar water in saucepan. Add 3 cups cranberries, 1/2 cup sugar and 1/2 cup water. Bring to a boil, boil rapidly until berries pop; approximately 5 minutes. Refrigerate to cool. Spray 9 x 13 inch casserole dish with nonstick baking spray. Combine graham cracker crumbs, 3 tablespoons sugar and melted butter. Press firmly into casserole dish. 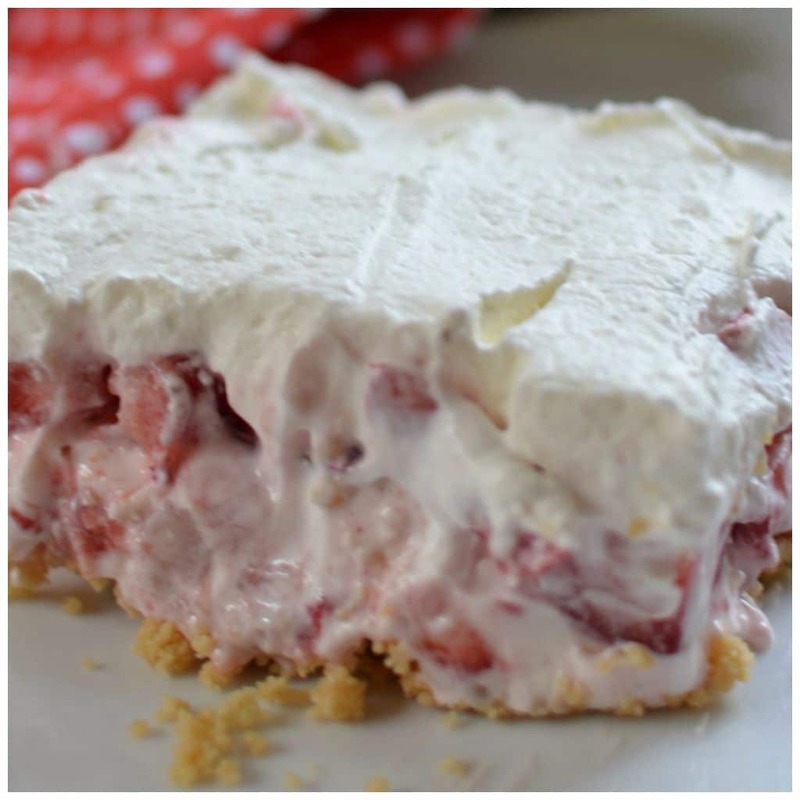 Place in freezer while you make the filling. Gently spread chilled cranberry sauce over the cream cheese mixture. Freeze for 1 1/2 hours. Add whipping cream & powdered sugar to mixing bowl. Beat just until stiff peaks form. Spread evenly over dessert. 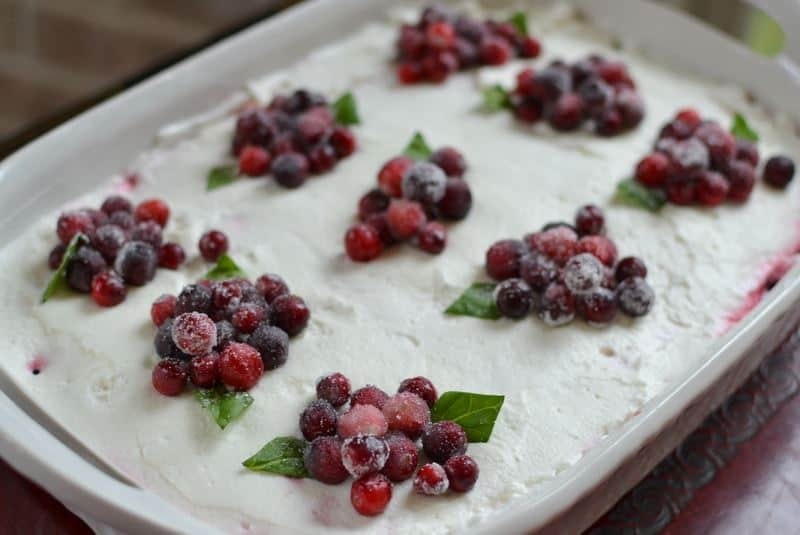 Top with candied cranberries. Arranging by estimated pieces. Cut spinach leaves in small diamond leaves and add to berry groups. Serve immediately. 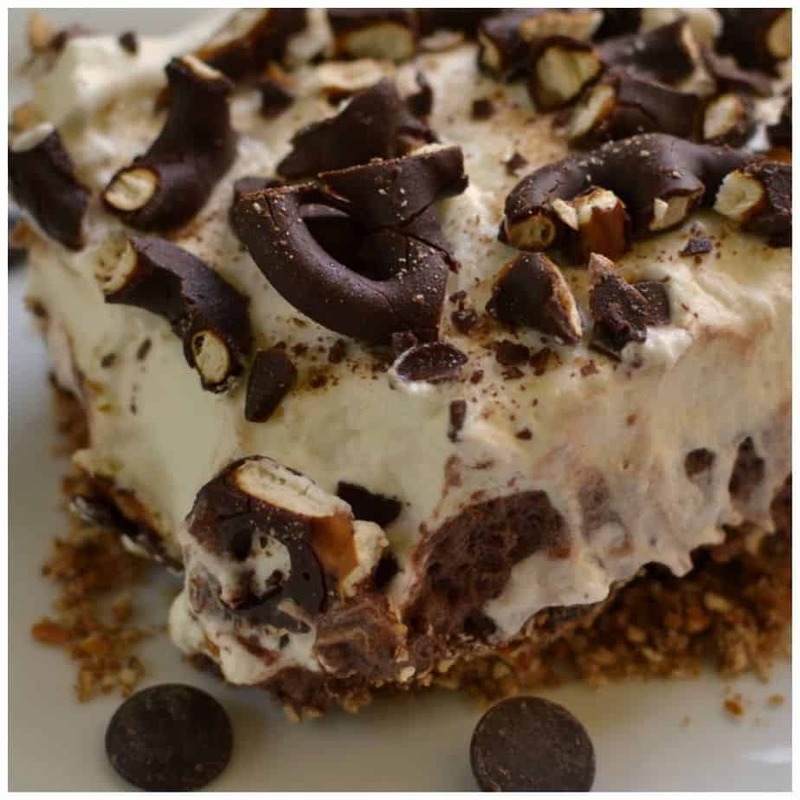 Other lush cakes you will love! !